If you live in an apartment, you may be worried about the price of rent more than you’re worried about a fire breaking out, but the risk for renters is very real. Fire protection is of the utmost importance when you live in the small confines of an apartment: unlike a house, you have minimal space between you and any potential fire. Additionally, because of the lack of space, it’s more likely that a fire will start in an apartment than it will a house. 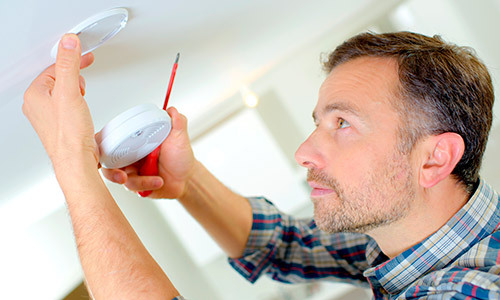 Those who live in rentals should put fire safety high on their list of priorities, and maintain a hazard-free place to live. Here are a few tips that will help keep you safe. For many people living in an apartment, there is only one main exit out of the dwelling – the front door. If the front door is blocked by an encroaching fire, residents may panic and not know how to escape from their apartment. This is why it’s critical to keep the windows unblocked and free from debris, clutter, and furniture – the windows in your apartment may end up being the only avenue of escape in a fire-based emergency. If you’re serious about fire protection as an apartment-dweller, you’ll want to put some serious thought into how you can safely heat your rooms. Many people in small apartments rely on space heaters for cheap and simple heating, but these small heaters come with fire risks that many people don’t anticipate. When using a space heater, be sure that you give the device ample room to function: don’t crowd it, don’t place it against a wall, and be certain not to place it close to anything flammable. Never leave a space heater unattended, and do not leave the heater on overnight, as you’ll be unable to notice a fire start up during the night. Kitchens are the top spot for fires to start in the home, and the risk is even higher in the tight spaces of an apartment. Many apartments have cramped, narrow kitchens, where residents find it difficult to squeeze in all their appliances and general kitchen needs. Where clutter is congregated, the risk for fire increases. Be sure to place any and all items on counters far away from the over and the stove top. Also be sure to clean your stove top regularly, to ensure grease does not build up and start a grease fire. Apartments aren’t known for their abundance of power outlets – as such, many people who live in apartments are forced to make due by crowding many plugs on to a single outlet, increasing the fire risk. Avoid overloading an outlet whenever you can, and invest in in surge protectors to prevent a fire from occurring. Outlets can easily become overworked and burn out – the leading type of electrical fire is caused by overloading power old and worn out power outlets. If any of your outlets seem to be suffering from age, speak with the owner of the apartment to see if they can be replaced.